On Friday the editors of the Daily News accused “Cannondale-mounted maniacs” of creating a “pedestrian perdition” by racing along the Manhattan Bridge “as it were the last leg of the Tour de France” and “[flipping] the bird at the working stiff from Brooklyn who’s who’s trying to burn off a few calories on the way home from the daily grind.” On Sunday, in a piece titled, “Cyclists up on their high horse about criticism of misuse of the Manhattan Bridge pedestrian path,” the editors doubled down. Our open letter to Transportation Department Commissioner Janette Sadik-Khan about the dangers of maniacal bikers on the Manhattan Bridge drew crazed responses from ..maniacal bikers. Note the caption. Where did the editors go to school, Marcia Kramer University? There’s one other problem with the photo used to illustrate the Daily News piece: it’s a photo of the temporary bicycle path. I understand that keeping the details of the detour straight can be as complicated as following “Who’s on First?”, but if you’re going to write an anti-bike editorial — along with a follow-up story in which you complain about people complaining about the first story — it’s important to get your facts right. In fact, I’d argue that it’s even more important when one of the chief complaints was that you didn’t get your facts right. Some invited us to bike the Manhattan Bridge with them to witness their law-abiding ways – which we will be doing on Monday morning, as long as we can find our dentures, bifocals and suits of armor. This is not correct. As I mentioned in an email to the Daily News editor on Friday, the point of tomorrow’s ride is not to show that cyclists obey the law with one-hundred-percent fidelity. No reasonable New Yorker would say that they do. The question is whether or not the Daily News misrepresented the issue, misled its readers, relied on tired stereotypes, and generated a false controversy based on the limited experience of “at least one member” of the editorial board. As Daniel Patrick Moynihan famously said, “Everyone is entitled to his own opinion, but not to his own facts.” Since I don’t accompany this board member on his daily jog, I would not even begin to argue with someone who claims to have been “cursed out regularly” for following the law. However, I think it is reasonable to wonder why an anonymous editorial writer can claim that “so many New Yorkers – even reasonable New Yorkers – are so dead-set against your bike lanes,” when the latest Marist poll shows that not to be true in the slightest. I hope the writer can tell pedestrians, bike commuters, and Daily News readers why he so blatantly ignored that basic fact. I would like to make it very clear that I have absolutely zero problem with pedestrians who continue to use the south side of the bridge while the detour is in effect. As inconvenient as the detour can be for cyclists, it is far more so for people on foot, and I can’t blame someone who sticks to his old routine rather than risk crossing the river of traffic at the mouth of the Manhattan Bridge. Anyone who commutes over the Manhattan Bridge on a daily basis knows that the span is safe and calm, even with the detour in effect. After all, it’s one of the few places in New York where cyclists and pedestrians are completely separated from maniacal drivers. I should note that our plans include a trip up the Bowery so that the writer can experience the real dangers this detour has created. Nevertheless, I’m under no illusion the writer will change his mind and escape the limits of his own confirmation bias, especially considering the original title for today’s editorial. I’m off tomorrow. Would you like me to come ride along with my helmet cam? I hope they don’t stand you up, or plan on walking both sides, or some other cop out. It is logistically pretty difficult to do what you plan on doing, which is the whole problem. It should be a lot easier to cross the river on foot and on bicycle than it is. If they do show up and you run out of conversation topics, might I suggest the toxicity of negative generalizations? As in, the way their opinion writers characterize all cyclists as one “biker”, all guilty of any offenses they have observed in any circumstances. They dismiss the people who’ve protested their nasty and prejudicial opinion piece as being the same “maniacal bikers” who offended them in the first place. Since I haven’t been on the bridge’s north path since the detour began, they are lying in at least one case. The Daily News editors might want to consider the historical company they keep when aggressively promoting negative generalizations. It’s not the good guys. You might also ask the writer why he said that so many NYers are “dead set” against bike lanes, even though there have been all these polls saying that 66% are in favor of ’em. I mean, I totally get it. They didn’t say “most.” They said, “so many.” Which could mean a dozen, a hundred, or a million. But the intent is really clear…to make it seem like the majority of NYers are against them. It’s kinda like Republican senators like Boehner who can’t bring themselves to say that Obama was born in the US and instead say that reasonable people have a right to ask questions. Um, no. Some things are just facts. The other question to ask might be, how many editorials have you written labeling drivers as maniacs with no regard for man-made law? Because we’re at about 91 deaths at the hands of bad drivers so far and zero at the hands of cyclists. If they can’t remember how many editorials they wrote on the subject of deadly driving, at least ask the writers if they can remember WHEN they wrote their last one. Good luck. I sincerely doubt that these guys are operating in good faith on any of this stuff. They have a story to push and a narrative to stick to, facts be damned. One guy on a bike will cut you off and that’ll be the end of it as far as the writers are concerned…all bikers are maniacs! Hell, you could get 100% compliance with the law and they’d still write this garbage. It’s about hating on Sadik-Khan and Bloomberg so there’s no reasoning with them. I will be shocked if an actual member of the ed board shows up — this seems like a job that will go to a jr staffer, who will probably be kind and apologetic. The piece they wrote today was so ill-mannered. Anyone else see JSK’s tepid response to that dumb editorial? 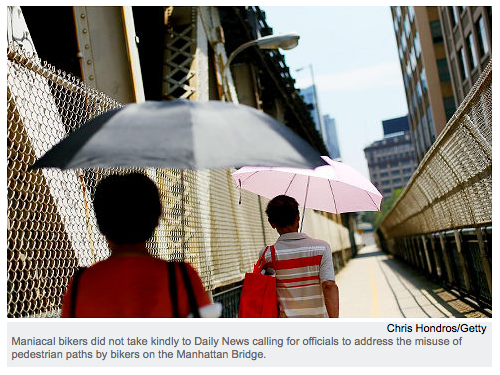 Manhattan: “Letter of the Law” (editorial, Aug. 12) reported instances of bike riders going the wrong way on the Manhattan Bridge during a construction detour. Doing so is wrong and dangerous, and we hope New Yorkers will heed our ad campaign, “Don’t Be a Jerk,” and call out the rogue riders. With social pressure, better signs and engineering and increased enforcement, we can encourage more cyclists to follow the rules of the road. Walking away from bike lanes that New Yorkers overwhelmingly support, and that help make streets 40% less deadly for pedestrians, would be a bridge too far. Seriously? Trotting out Don’t Be a Jerk when the Daily News has just lumped all cyclists together as illiterate scofflaw maniacs? WTF!?!? How about a better response? “It’s a detour. It’s New York. It’s not a problem.” It’s like she wasn’t even responding to the core of the editorial!! It was about the Manhattan Bridge, but she used it to talk about bike lanes!!! The Manhattan Bridge path is not a bike lane…it’s its own dedicated bike path. The 40% line she repeats everytime a new yorker coughs doesn’t apply here! You know how safe the Manhattan Bridge is? 100% safe. What’s happening on the bridge IS NOT DANGEROUS. It’s a fake controversey. She should of shut this down and told the DOT that they got it wrong. The DOT is its own worst enemy. Get a backbone! Great post! Keep posting stuff like this I really like it.